If you are looking for information on the Closets by Design franchise business opportunity, Closets by Design organization franchises or Closets by Design storage franchising, then you have come to the right place. As an industry leader since 1982, we've built our reputation on our commitment to unmatched customer service and total customer satisfaction. From our no obligation in-home consultation, to custom-tailored designs, to the highest quality product construction, Closets By Design does it all--with a lifetime warranty. Yet, even with these comprehensive services, we believe our products offer the best value in the industry. It all begins with our customer. Closets By Design will send an experienced designer to their home to learn first hand about what they need, and to help them envision the possibilities. Working within their budget, we will then design a customized system and present the plans to them. And, of course, the estimate is free. 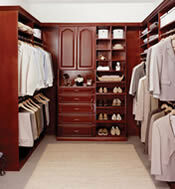 All Closets By Design systems are manufactured locally, in state-of-the-art factories. Using only the most skilled craftsman and the highest quality materials, we are so confident of our workmanship that we offer a lifetime warranty on all our products. Once each customized system is manufactured, an experienced craftsman will come to our customer's home and install the system to the exact specifications. Right before their eyes, our customers will see their dream system become reality. Closets By Design's franchise training program is more than just a few days of "how to do." Our training has been designed to educate the franchisee in every aspect of the daily operations of a Closets By Design franchise.